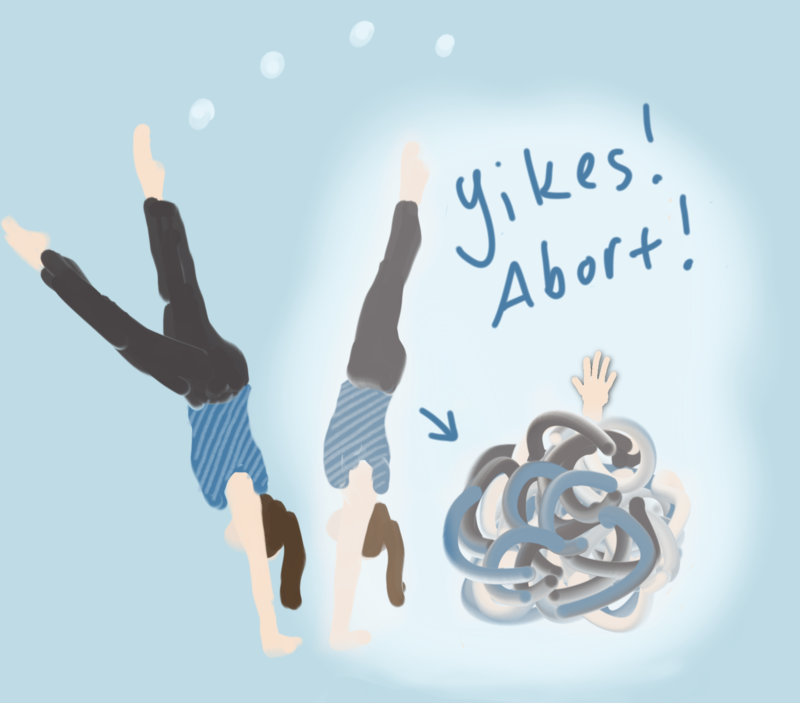 “I just don’t know why my handstands are SO bad,” an accomplished aerialist told me recently. “I know what to do, I have pretty good body awareness, but I just can’t stay balanced.” Handstand progress is usually s-l-o-w, but sometimes beginners are missing a crucial piece of info that, once put into place, allows them jump ahead in their balance ability right away. Seeing a student have that lightbulb moment and hold a handstand longer than ever, after just a single class or lesson, is one of my favorite experiences as a handbalancing coach! As I mentally sifted through the possible culprits for this aerialist’s inconsistent balance, I realized I had a catalog I could share that might help people who I can’t diagnose in person. So, roughly in the order that I’d address them in a student, here are eight roadblocks to holding a handstand into eternity. Fear of crashing can keep you from kicking up far enough in your handstand. Comfort cartwheeling out of a handstand means you can learn by safe trial and error. Fear of falling over. If you’re afraid of kicking up too hard to your handstand because you think you might fall over and hurt yourself, you’ll rarely kick up enough to achieve balance. But if you feel safe both underbalancing (not getting completely inverted) and overbalancing (going too far, past vertical), then you can slowly work toward consistently kicking up exactly the right amount, in between those two. 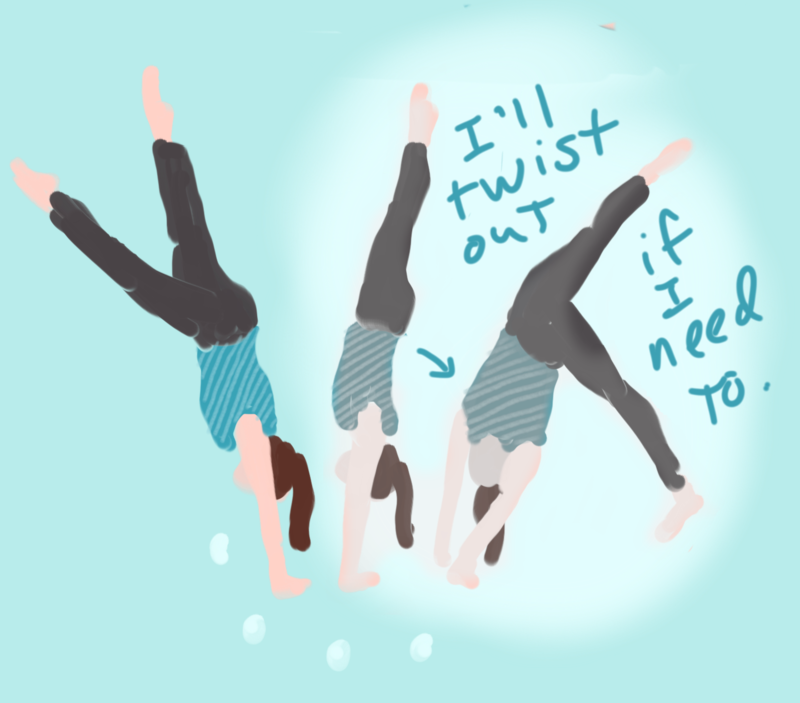 The solution: With an instructor, learn to twist/cartwheel out comfortably and safely. Hands too far apart. Almost everybody untrained who does handstands for the pure joy of them puts their hands too far apart. When you want to hold your handstand for longer than a split second, most people will have more success if their hands are directly under their shoulders so that their arms are vertical and their weight can go straight down through their bones into the floor. This distance might be far narrower than you imagine (I like about 12 inches between the tips of my middle fingers). The solution: Film yourself or ask a friend what they see; bring your hands narrower until your arms are parallel to each other. Then memorize the image of your hands on the floor the right distance apart, or note how many floorboards or tiles apart they are. Inflexible shoulders. Tight/closed shoulders that don’t open to 180 degrees overhead make it impossible to attain a straight body line. To compensate, you’ll have to send your shoulders forward in front of your wrists, bend your elbows, arch your back, or some combo of these. Because you can’t stack your body vertically, your muscles have to fight to keep you from faceplanting. With so much energy and attention going toward holding up your bodyweight, it’s hard to stay balanced. The solution: Increasing shoulder mobility is often a slow process, but as you work on it, you can still learn to balance your handstand in any shape; you’ll just need to get extra strong to stay on your hands. Once your alignment is set up, don’t change it — no matter what! Unstable core. Your handstand should be tight, rigid, and still. If the position of your ribs, hips, and legs keeps changing, due to lack of body awareness, lack of ab strength, or adjustments in search of balance or correct alignment, then there is too much motion going on for balance to be likely. After all, you can balance a peacock feather on the tip of your finger, but not a piece of cooked spaghetti. The solution: Isometric and stability drills in a hollow body, plank, and handstand wake up and strengthen the abs and improve the mind-body connection to keep them activated. Learning and memorizing the correct body shape can also help you avoid making too many adjustments while trying to balance. Body not in a vertical line. A handstand can be balanced in any shape — arched, piked, twisted, or contorted. But when all of your body weight is stacked directly on top of your center of balance, staying in the handstand becomes almost effortless. My first handstand blog post goes into detail about handstand alignment (read it here!). Focusing on the wrong body part. Many new handstanders try to determine if they’re losing balance by noting where their legs are overhead. This is not the most useful piece of information for making adjustments to stay balanced. 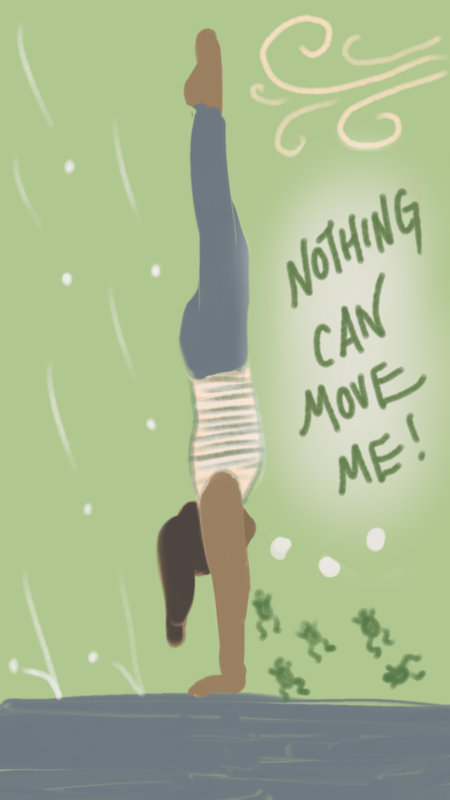 The solution: Set your body into its handstand and tell it to stay put while you focus on one thing: your hands. Even if your alignment isn’t perfect yet, call it good enough, freeze it (until your teacher comes over and taps your ribs again), and bring your awareness to your palms and fingers. Where do you feel the most weight? Fingertips? That’s the warning sign for overbalancing. Heels of hands? That’s the warning sign for underbalancing. Aim for right in the middle, at the base of your fingers, so that you have a margin of error in each direction. Keeping this attention to the weight shifts in your hands is the zen essence of holding a handstand. Your only focus for balance is on the weight in your hands. Feeling too much weight at the fingertips or heels of hands (shown in magenta) is a signal to pull your balance back to center (shown in all teal). Giving up on overbalances too easily. When you kick up to a handstand at the wall, you don’t have to kick the exact perfect amount to achieve a precise vertical line; if you kick too hard, the wall will stop you, right? So, what if you could kick too hard to a handstand in the middle of the room, then stop yourself, no wall needed? Kicking up the exact perfect amount is a lot to ask of yourself; instead, you’ll have so much more leeway if you can push down with your fingertips hard enough to put on the brakes. The solution: Strengthen your fingers, hands, and forearms so they replace the wall as the thing that stops your handstand at vertical. Then take responsibility and fight for your balance, steering your handstand with your hands. Not saving underbalances. Digging your fingers in only helps when your handstand is falling over backward. You need the tools to save an underbalanced handstand as well (one that’s falling toward your front, back down to your feet). The solution: (1) Attention: by sensing where your weight is in your hands, notice right away when you need to make an adjustment, before you’ve drifted past the point of saving. (2) Sucking in your stomach, slightly adjusting your hollow-body shape, planching your shoulders forward, and bending your elbows are all tools to pull your balance forward while minimizing the change to the rest of your handstand. Put these solutions all together, and your handstands will last longer and longer as your balance steadily improves. Of course, to implement these solutions yourself, you may need more information than I can give in one blog post. Seek out a handstand or gymnastics coach for safe, detailed, and personalized instruction. And I’ll add each of these solutions to my list of topics for possible future blog posts — stay tuned!